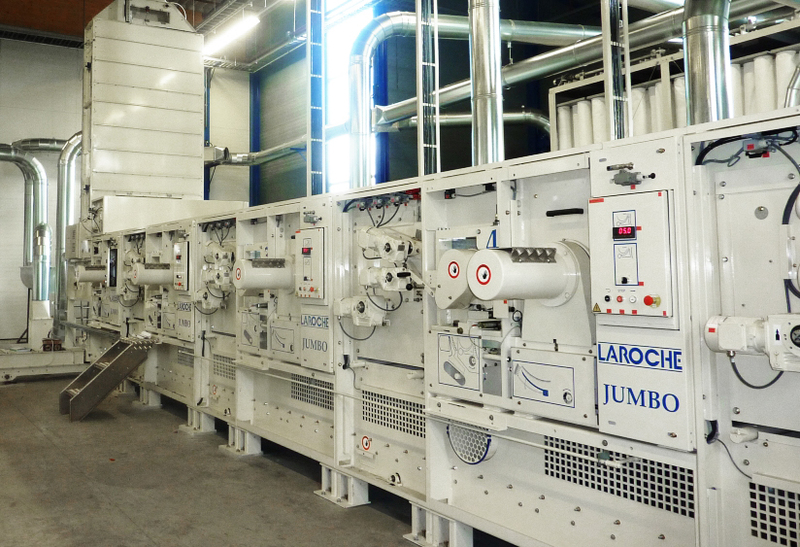 Soft wastes cleaning lines, from 100 kg to 1000 kg/h, Tearing lines for all kinds of textile wastes from 50 to 3000 kg/h, make of LAROCHE the worldwide leader in these fields. More than 2000 Tearing lines have been installed in the whole world. 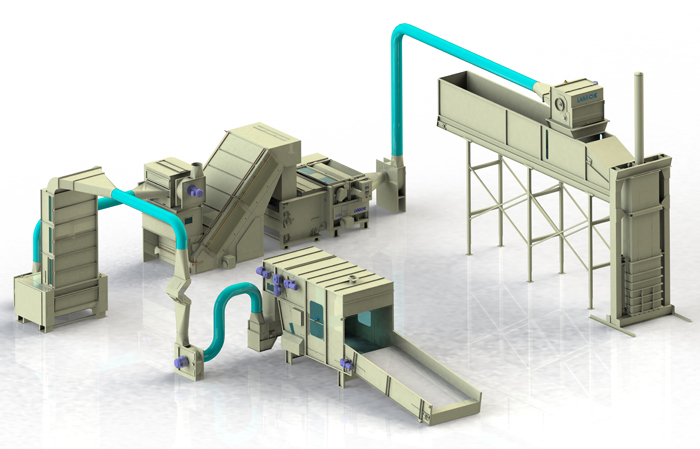 Cotton waste opening and cleaning lines for respinning.Modular concept for high production capacity and high fiber yield. Hard waste tearing lines for respinning. High quality regenerated fibers. Completely automated tearing lines. Regenerated fibers for nonwoven processes and ideal for LAROCHE Airlay process for a wide range of applications: mattress, furniture, insulation, automotive, carpet underlayer, wipes… High production capacity. 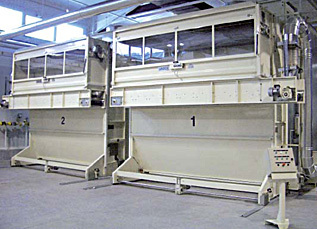 From a simple system with 1 or 2 rotary cutters to a complete cutting plant with robot feeder followed by two cutters at 90°. STARCUT: Rotary cutter with cutting head with 2 or 4 flying knives and feeding conveyor rolling out of the machine for easy access. Built-in sharpener. Option: metal detector, dedusting of the cutting head. Designed for in house recycling of spinning, weaving, knitting and drylaid nonwoven wastes. Available from 2 to 6 opening sections. Accessories: sharpener – fiber lubrication. 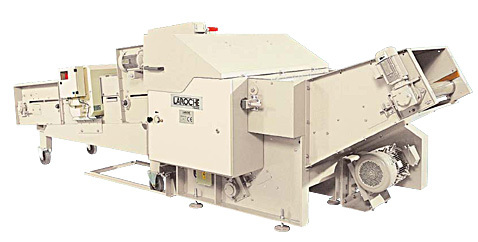 Designed for the recycling of all hard textile wastes for opimized fiber quality. Accessories: sharpener - fiber lubrication. Option: beater rollers cleaning device. 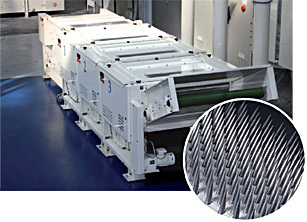 Specially designed for high production capacity. Available from 2 to 6 opening sections. Adjustable settings while running. 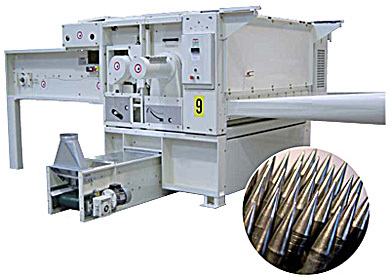 Perforated cage rolls out the machine for easy maintenance and cleaning. Options : beater rollers cleaning device. Designed to pre-open old rags, carpets and moulding wastes... and bast fibers.